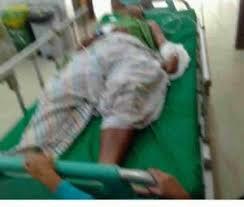 It was learnt that a security guard in Indonesia is recovering in hospital after winning a brutal fight to the death against a giant python. 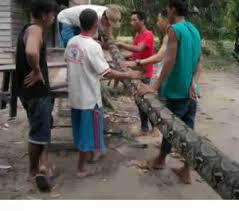 Brave Robert Nababan says he came across the 23ft serpent on a road on his way home from work in the Indragiri Hulu Regency of Riau Province in north-western Indonesia. The 37-year-old was riding his moped home from his job when he saw two pedestrians blocked from crossing the road by the huge snake. 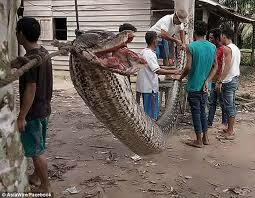 From his hospital bed, he related the story of how he had tried to get hold of the snake to move it. The wrestle was clearly brutal as Mr Nababan suffered deep lacerations to his left arm and hand. It was also reported that he was suffering from exhaustion, hinting that the fight with the snake went on for some time. Grisly proof of the win could be seen in Mr Nababan’s village as the snake’s body was seen strung across washing line trees like a washing line. It is not known how the snake was killed as Mr Nababan’s family ordered journalists out of the hospital before he could finish his story. The unlucky python may be a reticulated python (Python reticulatus), the largest specimens of which can sometimes reach 23 feet. The Guinness World record for the longest snake ever to be held in captivity was for a reticulated python called Medusa that measured a whopping 25ft and two inches.